Much more than just a measurement tool, the activity-based, field-tested Assessment, Evaluation, and Programming System for Infants and Children (AEPS) links assessment, intervention, and evaluation for children from birth to six years who have disabilities or are at risk for developmental delays. With this reorganized, extensively updated second edition, you can assess and monitor six key developmental areas in young children: fine motor, gross motor, cognitive, adaptive, social-communication, and social. AEPS helps identify educational targets tailored for each child's needs, formulate developmentally appropriate goals, conduct before and after evaluations to ensure interventions are working, and involve families in the whole process. Age Focus: 0-6. Spiral, 336 pgs. 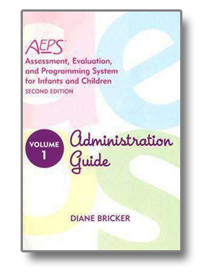 Also available: AEPS Test for Birth to Three Years and Three to Six Years, AEPS Curriculum for Birth to Three Years, and AEPS Curriculum for Three to Six Years.